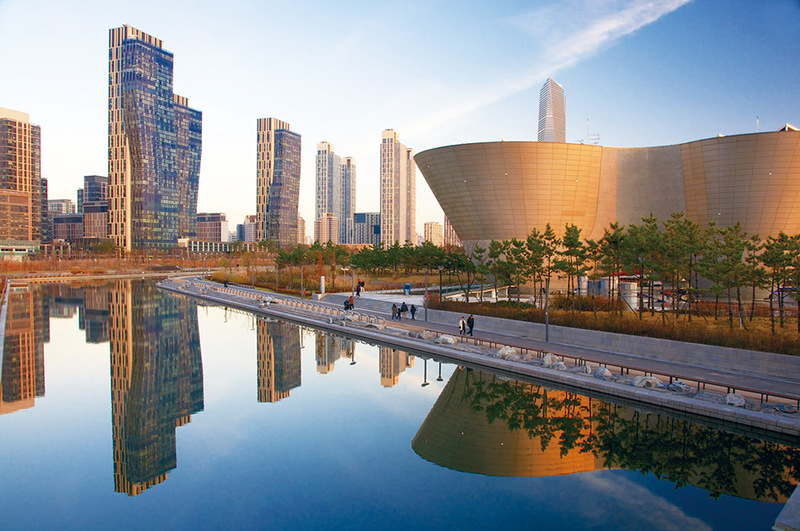 Lauded in the international press as Korea’s “city of the future,” Songdo is a marvel of information technology and sustainable urban planning, a “smart city” that effortlessly integrates digital interfaces into the community’s every eco-friendly sinew. It also happens to be a cool place to visit on a weekend. Built completely from scratch on reclaimed land, Songdo seamlessly combines cutting-edge architecture and green space to produce an urban environment completely unlike any other in Korea, if not the world. Cruise boats on saltwater canals, wooded campgrounds amid glittering forests of towering skyscrapers, first-class shopping and dining – a little of something for just about everyone. If you’re a bicyclist, especially, you won’t find a friendlier city anywhere. From a distance, Songdo’s impressive skyline hints at some sort of Korean Dubai. To be sure, there’s plenty of super-tall skyscrapers, most notably the landmark Northeast Asia Trade Tower, currently Korea’s tallest building at 305 meters and 68 floors, from whose top-floor observatory (to be opened to the public soon) you can enjoy stunning views of the city. What really impresses about Songdo, however, is not the vertical space but the green space. The city’s planners incorporated features of the world’s top cities into the town’s blueprint, including the famous system of squares and parks in Savannah, GA. 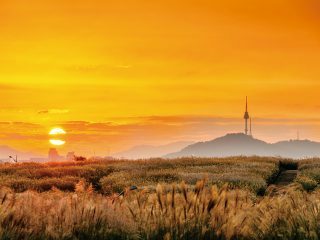 In Songdo, you’re never more than a five-minute’s walk from a park. The gem of Songdo’s park system is Central Park, modeled on New York City’s park of the same name, naturally. 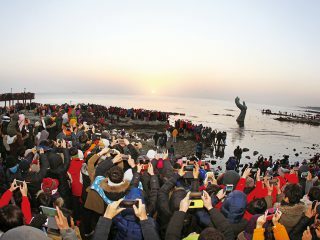 Unlike Manhattan’s version, however, Songdo’s 101-acre space is centered on a scenic seawater canal that is refreshed every 24 hours to better contribute to the ecosystem. In addition to being a lovely place to stroll about, the canal is a good way to get from one end of the central business district to the other using one of the water taxis that leisurely cruise along it. 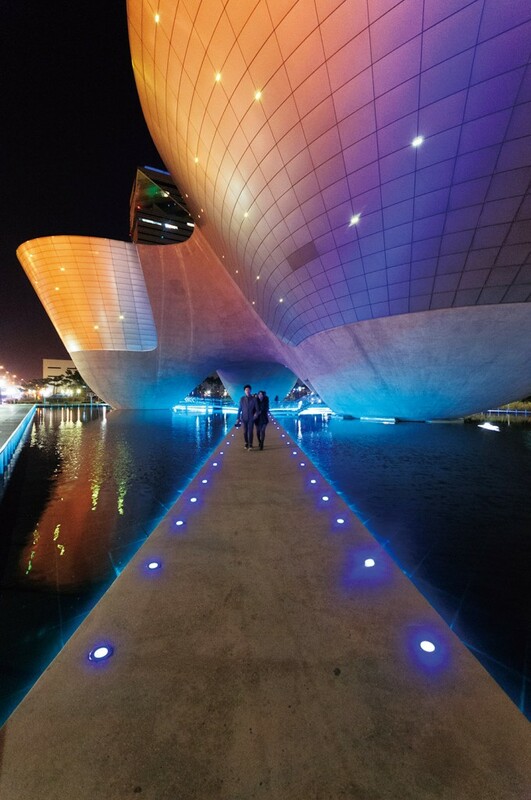 Central Park is also where you’ll find one of Songdo’s most unique pieces of architecture, the Tri-Bowl. Resembling three upturned clam shells (or, as the name suggests, three bowls), this picturesque landmark hosts regular concerts, exhibits and other cultural events. There’s a coffee shop, too, for the more casual visitor. Two other wonderful stretches of outdoor space are Sunrise Park and Michuhol Park. The former, as the name would suggest, is a great place to see the sun rise from an artificial hill that overlooks this space’s charming forests, ponds and lawns. The latter, meanwhile, pays tribute to Songdo’s culture and history with Korean gardens, stone monuments and a pond-side traditional teahouse where you can experience a Korean tea ceremony (T. 032-425-4745). Songdo’s parks are also popular places for families and couples to bike around. Tandem bikes can be rented at Central Park, while more kiddie-friendly “green bikes” can be rented at Sunrise Park. 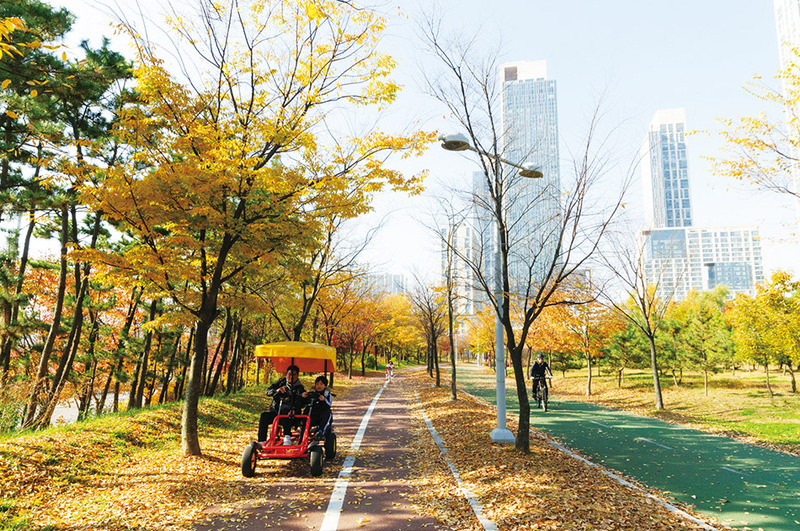 If you’ve got your own bike, however, you’ll find Songdo to be your dream city, with an extensive network of dedicated bike lanes that crisscross the urban landscape. Shoppers and diners, meanwhile, won’t want to miss Canal Walk, a beautifully designed shopping mall/residential space built along a canal flanked by decks and walkways. You’ll also find plenty of charming, European-style canal-side cafés, too. The shopping here is top-end, with all your favorite local and overseas brands, as well as a bookshop for the more studious types. Canal Walk is divided into four sections, each one named for a season. Spring has alteration shops and furniture stores, while summer has women’s wear, young casual shops and kids’ wear. Autumn features more casual shops, cosmetics and dining, and winter focuses primarily on outdoor wear. The streets around Canal Walk are lined by towering apartment complexes, shops and restaurants, many of which are artfully designed. It’s an exotic cityscape that makes it a popular spot for TV crews and music videos. Most notably, many of the scenes in the hit Korean music video “Gangnam Style” were shot on these streets and in Central Park. EAT> For a romantic evening, try the seafood buffet on the 21st floor of the Technopark complex’s Michuhol Tower (Exit 4, Technopark Station, Incheon Subway Line 1). It’s a bit pricey, but the food’s good, the interior is classy and the views of downtown Songdo and, weather permitting, the Incheon Bridge cannot be beat. Even if you don’t see another person in the city itself, this place is often full, so it’s best to call ahead to reserve a table–give them a ring at T. 032 260-0088. You can enjoy equally good views at The Terrace (T. 032-260-0077), a fine dining establishment/wine bar on the top floor of the nearby Get-Pearl Tower. A bit more cozy but with equally stellar views is the buffet restaurant on the 19th floor of the Songdo Park Hotel, with views of both Central Park and the ocean. This place tends to fill up, too, so make a reservation at T. (032) 210-7360-1. The hotel is one the southwest side of Central Park. While the space doesn’t have the bird’s eye views, the restaurant/tapas bar What’s David’s? (T. 032 833-1225), run by a Korean and British couple, is popular for its good pasta, pizza and steak, as well as its authentic European atmosphere. It is located near Central Park. GO>University of Incheon Station, Incheon Subway Line 1. From downtown Seoul, the trip takes about 1 hour, 30 minutes.